Lucy Dalglish, Executive Director of the Reporters Committee for Freedom of the Press, interviewed David McCraw, Vice President and Assistant General Counsel, The New York Times Company, during the morning plenary session, "The Aftermath of WikiLeaks: The tensions between State Security and Freedom of Information." Photo courtesy of John Ramspott (jramspott) on Flickr. 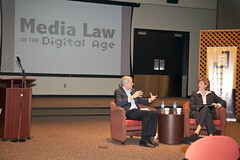 On Saturday, October 22, I attended the 2011 Media Law in the Digital Age conference, co-sponsored by Kennesaw State University’s Center for Sustainable Journalism and Harvard Law School’s Berkman Center for Internet & Society. After the morning’s plenary session, I attended a panel on “Online Community Building and Managing: What are the Legal and Editorial Concerns You Need to Know?” David Ardia (Assistant Professor, UNC School of Law), Johnita Due (Senior Counsel for Corporate Services, Turner Broadcasting), Lesli Gaither (Dow Lohnes, PLLC), Amanda Martin (General Counsel for North Carolina Press Assn., and Partner at Stevens Martin Vaughn & Tadych, PLLC), and Vera Haller (CUNY) did a great job of managing a lively conversation about the pleasures, perils, and pitfalls associated with building online communities around user-generated content. After lunch, I attended the panel “Social Media and Its Legal Implications: Where Your Personal Life Meets Journalism.” In that session, Josh Azriel (Associate Professor of Communication, Kennesaw State University), Amy Kristin Sanders (Assistant Professor of Mass Communications and Law, University of Minnesota), Justin Brown (Assistant Professor of Telecommunications, University of South Florida), and Josh Levs (Journalist, CNN), offered an engaging discussion of how traditional and citizen journalists are and should be using social media to report on current events. As I listened to the ongoing exchange between panelists and conference participants, one thing became clear. If professional journalists find the legal and ethical waters of online journalism tricky to navigate, then how can citizen journalists, who may lack formal training in dealing with such issues and certainly don’t have access to in-house counsel when they arise, be expected to deal with them? Because deal with these issues they must. If I understand the general consensus expressed by the legal experts who spoke, US law makes few distinctions between citizen and professional journalists. Except for narrow exceptions created by a variety of state laws that create a reporter/source privilege for professional journalists, they generally have the same legal rights and the same legal obligations. Similarly, a citizen journalist may not understand that, while it may not necessarily be a crime, most professional journalists regard releasing the names of unindicted suspects or victims of sexual assault as ethical violations. Nevertheless, citizen journalists are capable of inflicting, through their unknowing ethical lapses, the sort of individual harm such ethical codes are intended to mitigate. So what do you think? I’m approaching this as a teacher of writing and communication and a critical legal studies scholar, not as a journalist or media lawyer. So I’m very interested in hearing if anyone is already working on something like this. I’d love to know what is out there. I’m also very interested in hearing potential problems with or concerns about the idea. Robin Wharton is Assistant Director of Writing and Communication. She holds a law degree (1999) and a PhD (2009), both from the University of Georgia. Her current project involves exploring the influence of common law poetics in Middle English writing. Since 2005, she has been a collaborator on the project, and she is interested in how multimodal writing and communication instruction can be improved through the strategic application of digital technology. A former ballet dancer, she has also begun to consider how pedagogical methods drawn from the performing arts might be adapted for productive use in the higher-education classroom. Prior to graduate school, Dr. Wharton clerked for the Hon. Curtis L. Collier in U.S. District Court for the Eastern District of Tennessee, and then spent a number of years as an associate in the intellectual property group of a prominent Atlanta law firm. She continues to write about law and ethics, especially as they relate to digital humanities work, and to consult in legal matters involving new and traditional media. Profile photo by R.E. Burnett, 2011. Tagged conference, copyright, journalism, online community, social media.